Abstract: When seeing the advertisement of Airwheel intelligent scooter, a large number of people have the following question: why should I abandon the private car and choose Airwheel intelligent scooter? From the aspect of efficiency, environmental protection, and high technology, Airwheel shows the reasons one by one. Airwheel intelligent scooter, as a brand new concept and product entering the transport market, still meets the questions from the general public. Especially to those who have already brought a private car, they are not sure whether should they change to Airwheel Airwheel. Today, Airwheel is going to show them all the reasons. An important function of the personal transportation is to deal with the trip on and off duty. Driving seems convenient, but when the number of drivers is soaring, the traffic jam becomes more and more serious, so drivers actually waste a lot of time. However, Airwheel intelligent scooter is more flexible. One can ride easily through crowed, cars and bikes, which is really convenient and time saving. Driving private cars leads to a serious problem—air pollution. The emission ruins the fresh air and the blue sky. Many people have realized this. 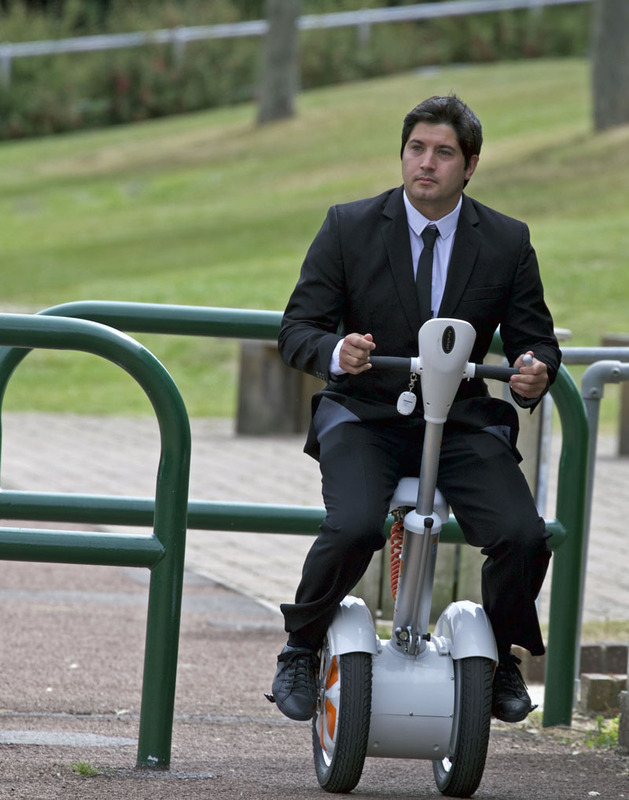 Airwheel electric scooter is driven by electricity, which is a clean and renewable energy resource. Riding Airwheel for one hundred mile only consumes one or two degree of electricity, which is eco-friendly and environmentally friendly. People are always curious about the latest high technology, then and Airwheel is an outstanding chance to experience of intelligent riding. The original automatic steering-sensor system, the original hydraulic suspension, the electronic brake system all makes Airwheel a more excellent brand. Another shiny point of Airwheel self-balancing scooter must be the A3 and its sitting-posture model. The release of A3 perfectly changes the stereotype of intelligent scooters and makes possible the long-distance traveling, which attracts a large number of customers. Riders now could comfortably sit on the leather sadder, laying their feet on the stainless steel pedals and hands on the silica gel handlebars. Till now, Airwheel’s advantage is easily to be told. Stop driving cars anymore and choose Airwheel intelligent scooter. The life will be more convenient, eco-friendly and efficient. Next：Why People Choose Airwheel Two-wheeled Electric Scooter?